SolarVu® is normally specified as a balance of system component that is purchased and installed by the project developer as part of a complete solar PV system. It can however be purchased directly for existing systems either by an installer or site owner. 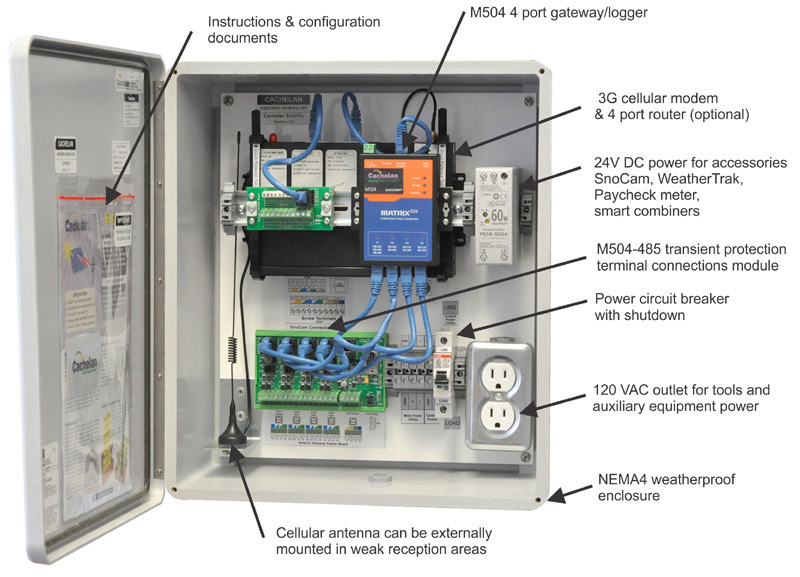 Although a SolarVu® energy portal is based on standard templates, each system has different equipment and internet connection requirements. Consequently, a final quotation starts with completing a configuration form to determine the necessary site hardware, desired customer options and screen layouts. SolarVu® for a simple 10kW system with 2 inverters will start at $1,395 for standard features. Additional optional enhancements like larger or multiple inverters, 3G cellular connection, SmartStrings™ etc will be quoted at added cost. For a simple system the configuration can be completed in a few minutes while larger systems may require additional details like combiner string layout assignment or corporate LAN settings. Each site is programmed to match the specified inverters, combiners and network so it begins to function as soon as it is installed. This minimizes site commissioning time. Creating a custom banner with customer logo, uploading slideshow pictures and portal settings is included. Technical support is available to installers to assist them in getting the site operational and making any necessary changes. All SolarVu® features are included for the first 2 years after purchase of a SolarVu® system. After that time, monitoring and lifetime data storage continue to be free. Advanced Analyzer diagnostic tools and SMART Enterprise reporting are available for a monthly fee with a SurePoint™ subscription. SurePoint™ status with days remaining will be displayed on Analyzer screens and can be renewed at any time. SurePoint™ uses analytics to provide fault warnings with detailed system information to enable fast diagnosis of problems. It identifies what needs to be fixed which minimizes O&M time and eliminates unnecessary routine maintenance checks. Download the SurePoint™ Features summary for details of the features SurePoint™ provides to help system owners maximize generation revenue. When SolarVu® is purchased and installed on behalf of the end customer as part of a total system, the dealer/project developer logo with a link to their website will be added at the bottom of each SolarVu® screen. They will also receive a free SMART Enterprise account with each new SolarVu® site added to enable them to monitor their installed systems, answer customer questions and provide quality maintenance support.